Delhi people are known as very foodies in nature. We like to taste all kinds of food we get. And, eating street food from morning to till late night in the street corners at small food stalls and Rediwalas ( seller who sells in small 4 wheel cart) is we Delhi people’s culture. We don’t care whether its healthy or not, but it must be tasty 😛 . I will say, we Delhi people are slaves of our tongue which makes us do anything for eating some or India originated street foods, which we have been eating over centuries. In this post, I am going to show you 10 pure Indian street food , all originated and developed in India but very famous in Delhi , so does in other parts of India. There are many street food but I am only including top 10 in my opinion. 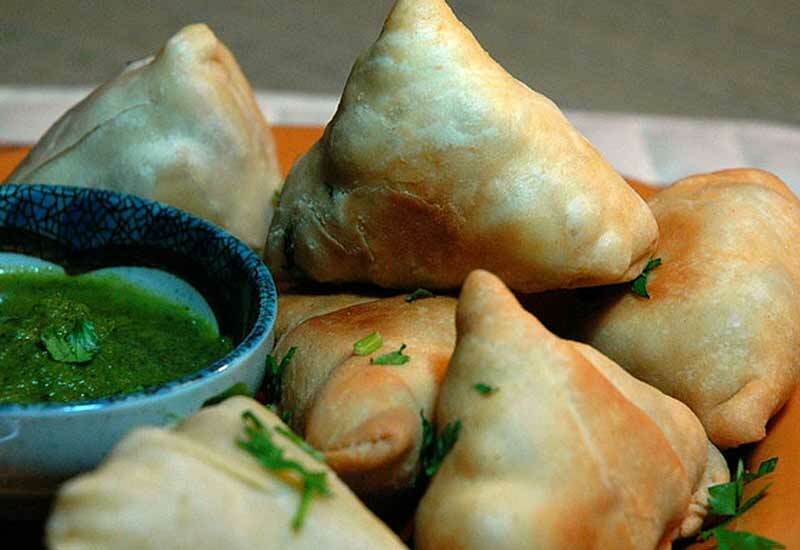 Not only Delhi but complete north India including Nepal, Bangladesh, Pakistan and many other South Asian countries are fan of this absolutely spicy and tasty snack – called Samosa. You can eat this in the morning with tea or at evening around 4-5 or during day time. Indian people love this food all from their heart. 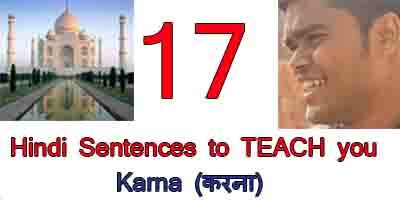 This is found entire year in India. Every morning in roadsides, you will find all tea stalls keeping Somosa. It’s spicy vegetables made with potato, peas, cheese etc rapped by dough and boiled in cooking oil. We eat this with chutney which generally come two types – green (little sour) & red (sweet). Samosa works fantastic with Chai. 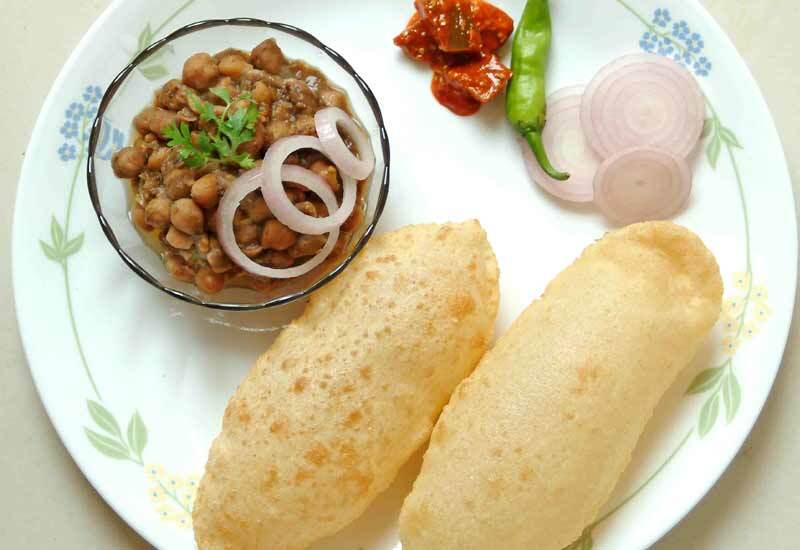 Chhole Bhature is pure Delhi food, in every street and corner, in every sweet shop whether its Aggarwal’s or Bikaner’s, you will get this balloon shaped food. Bhature is big swollen balloon like maida (all purpose flour) made oil fried roti while Chhole is spicy chick peas curry. Gogappa is one the most famous Indian snack – street food in India as well as abroad. These are swollen ball like food made with either wheat flour or Sooji flour. We break that small balloon shaped and fill with very spicy, sour, peppery water and we put whole in mouth. To be honest, Indian women seem crazier for this food than men. 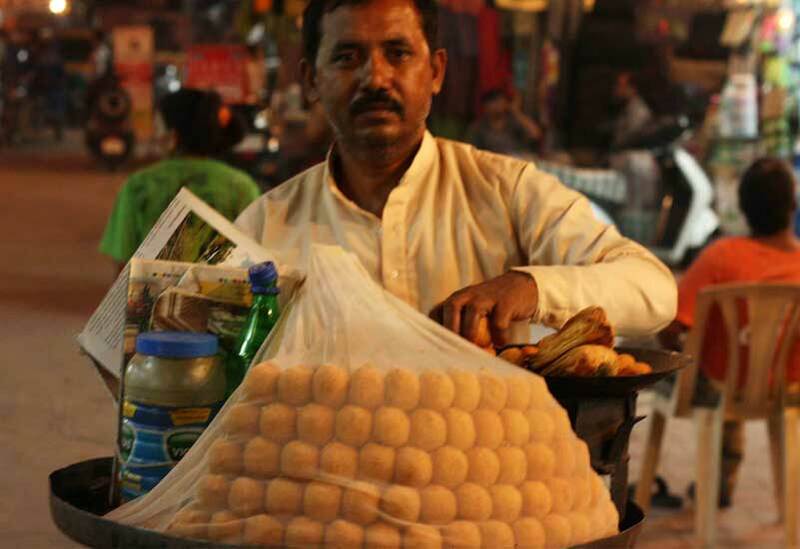 At evening time, you will find every round bar and corner hijacked by these golgappa walas . And men, women, kids all by taking a small plate on hand like beggars stands in front of golgappa wala and he gives everybody one by one. Personally, I like its golgappa’s water more. Kulche Chhole found in the street of New Delhi. It’s another super loved street food of Delhi. There are two things in this food- bread & curry. The bread is like roti/chapatti but not thin & round it is normally. It’s more like rectangular, thick and spongy which we eat with very peppery & spicy dried chickpeas curry. See, this is how people sell Kuche chhole in the street of New Delhi in cycle – restaurant. 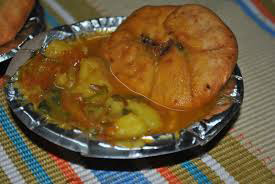 A puri shaped food with very spicy fillings of lentils. Though its Rajasthani food , it is very famous in Delhi. 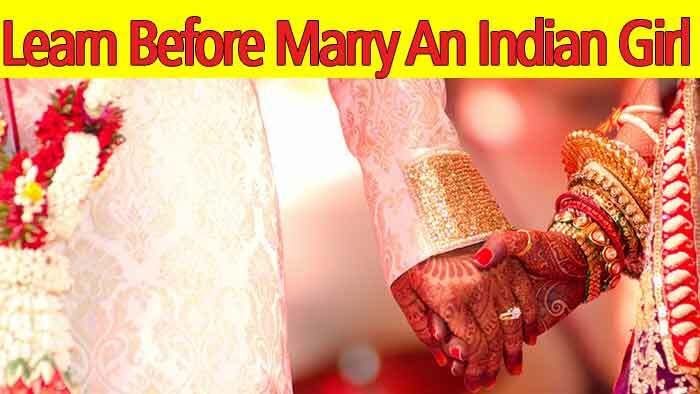 As you know , Rajasthani is close to Delhi so, we do have many foods, culture , dresses exchanges. Generally, we eat Khasta Kachaur with hot peppery & spicy potato curry. We break the Kachauri it small pieces so that it will get deepen into the juice of curry and then eat with spoon. It’s amazing. Remember, every time you will eat this, your nose will start running it: P as its very spicy and peppery, but you will enjoy it so much. A small ball like food made with Moong & Chickpea’s lentil’s flour. Deep fried in oil and served with spicy green chutney made with coriander, ginger, garlic, mint etc. It’s decorated with onion and radish. In your plate of Ram laddu you will always get one deep friend Chiili pakauda, which adds the taste in your tongue. But don’t worry generally such chillis are not so peppery. 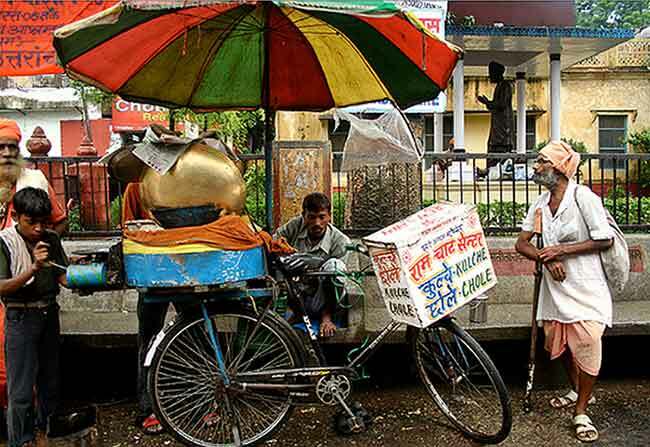 This food is more famous in winter but , you will get Ram laddu in entire season in the streets of Delhi. 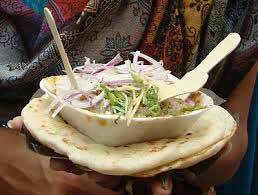 Chaat originated from Uttar Pradesh India, had win the tongue not only Indias but also Nepali, Bangladeshi, Pakistani and many others. 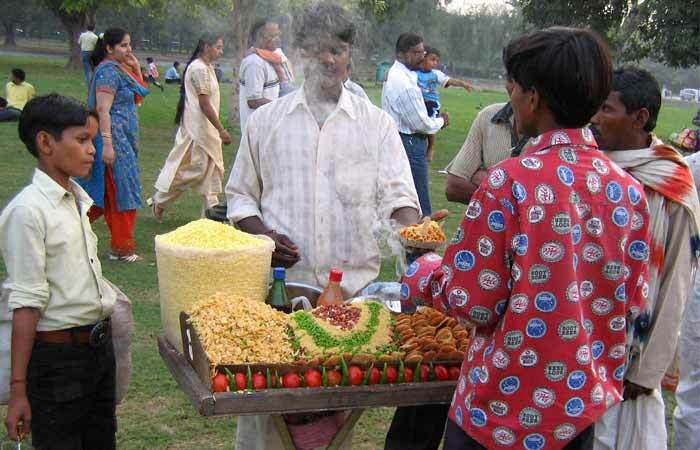 You will find chaat seller in street stalls as well as in good restaurant. Being Delhities, we love this food always, whether it’s winter or summer. It is one of the all time favorite snacks. 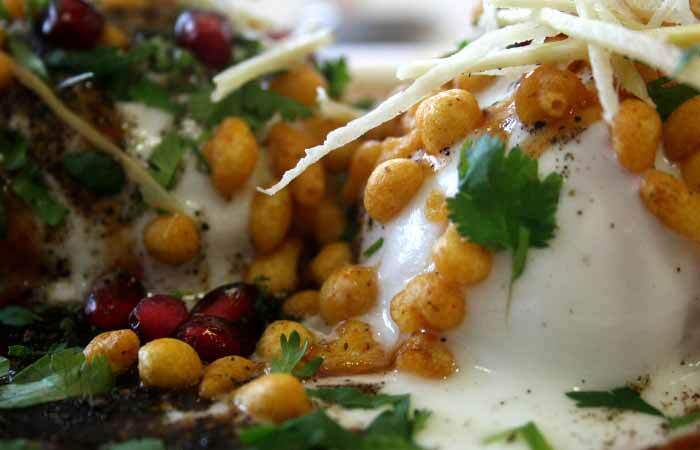 Chaat means to lick and I am sure you will lick your plate hehe 😀 . There are various types of chaat but some common ingredients of chaat are potato chips, dahi bhalla, yougurt, chopped onions, coriander, sev ( salty noodle), chaat masala consisting kala namak ( rock salt), amchoor, dried ginger, red pepper, black peper, and many more. Aaloo tikki from the name it is very clear, Aaloo means potato and tikki means a small piece. So, it means a small piece of potato which is very deep fried in oil. The boiled potato are deep fried and served with many spice, sweet chutney and curd (yogurt). It’s not so spicy so don’t worry about burning of your stomach and mouth. You will find Aloo tikki wala everywhere in Delhi along with Golgappa / Paanipuri. Bhelpuri is famous on go street food all over India, Nepal, Bangladesh and many other south Asian countries. Again it’s a spicy, pepery & sour food mixture of many ingredients like chickpeas, sevaiyan , onion, chilli, many kinds of friend lentil, namkeens, beaten paddy, tomato and many more. You will find Bhelpuriwala in every nook and corner of India, specially northern India. Not only girls, boys are also crazy for this food. In street – INR 10 -20 (US $ 0. 10 – 0.32). But you can order for any denomination. This is not found in restaurant, I have not seen so far. This typical street food. Dahi means yogurt and bhalla means balls. Bhalla is prepared by deep frying the balls made by different lentil flour, potato etc. Bhallas are crushed and yogurt is added along with some sweet chutney, spicy green chutney and some spices. It’s sweet, sour & spicy snack famous all over India. 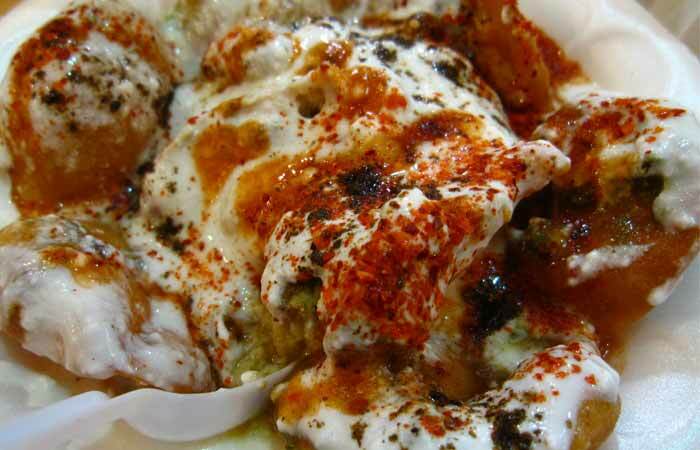 You must try this Dahi bhalla in your visit to India. 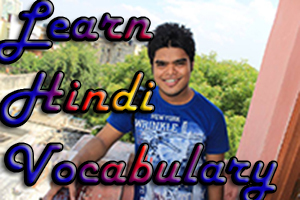 It’s very popular among Delhi people.